The author of Goodnight, Goodnight, Construction Site (2011) moves on to a different kind of vehicle with this rhyming story about the invention of alternative sleighs for Santa’s Christmas Eve deliveries. Just two weeks before Christmas, Santa’s elves discover that his usual sleigh, stored away for a year, has been damaged. The elves decide to hold a contest to build a new sleigh, with Santa choosing the winning entry. Twelve teams are formed, with one new invention revealed over each of the next 12 days. 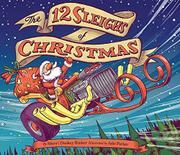 The sleighs are wildly imaginative, with different types of power and similarities to actual modes of transportation. On Christmas Eve, one rebel elf who has worked alone reveals Santa’s original sleigh restored to pristine condition. Santa opts for this traditional choice, so the elves take off on a race with their new inventions. The text uses varying rhyme schemes, starting off well but becoming more difficult to read as the story progresses. Several terminal word pairs do not rhyme correctly, slowing readers down. Busy, bright illustrations capture the intricacies of the unusual inventions and the antics of the elf crew. The elves appear androgynous, some with light skin and some with brown skin; a few have gray hair. Notably, the elf who restores Santa’s beloved sleigh has brown skin; Santa is white.